Fly to Australia? Check out offers at Karstadt-Reisen.de! Click on the marked parts of the map or scroll down to see the picture selection. 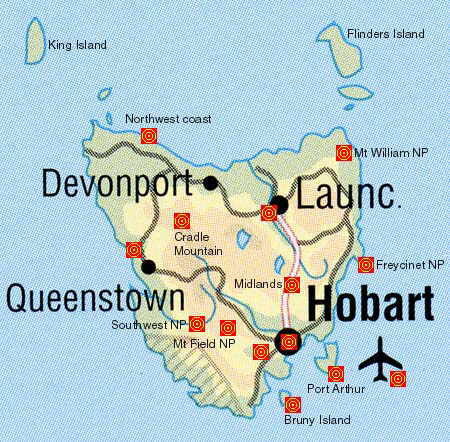 Tasmania is the only island state of Australia and its history is characterized by the isolation. The first European seeing Tasmania was the Dutch Abel Tasman in 1642 who named the island Van Diemen's Land. Until 1798 - when Matthew Flinders sailed around the whole island - people thought that Van Diemen's Land belonged to the Australian mainland. Flinders named the strait between Tasmania and the mainland Bass Strait after his surgeon. Van Diemen's Land was a prisoner's colony until 1856 when it was officially renamed Tasmania.